A little reminder of where all the money went. WARREN BUFFETT, Berkshire Hathaway: It should be a land of opportunity. And people that get rich. They -- nobody is going to confiscate everything or anything of the sort. WARREN BUFFETT: Yes. So, I get super rich. And somebody whose adenoids are in a certain arrangement gets rich. But television makes a lot of people rich. I mean, Lou Gehrig held out for $25,000 in the late '30s. You know, they benched him. They didn't bench him, breaking his streak, but he had a long -- he had a long struggle. Television has made the .230 hitter or the .240 hitter better than Ted Williams at .406. So, it -- there's a lot of serendipity. We -- everybody in this country owes their good fortune in some way to the rest of the country. Just out of curiosity, what would you do about this situation, John? Do you want the government to reslice the pizza in an egalitarian way, or do you want social safety nets made of electric guitar strings for those who get shtupped by free markets and private ownership? Or something else? 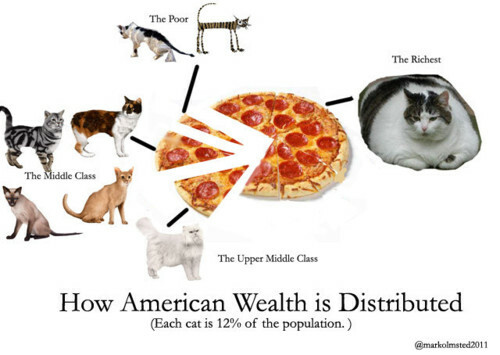 Expand wealth--i.e., bake a bigger pizza? P.J. O'Rourke claimed somewhere that the economy isn't a pizza where if you take too many slices, I have to eat the box. I don't know about that, but I do know I like a lot of Cat Chow on my pizza. I have no idea what I would do. Sweden seems to have a better looking pizza, but they have a very different oven. And maybe that's a trick of the light. Dinner's never fair. Everyone starts running to the table from a different starting point. But at least we can be honest with ourselves about the toppings. It's too early for pizza. How about a "breakfast pizza," Fuzz--you know, eggy and a bit bland, for matutinal digestion? That's a very sane answer, John. The New2 Sincerity? The New Spirituality?